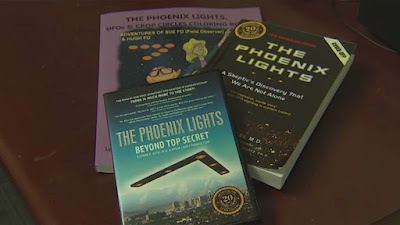 Mac's UFO News: Phoenix Lights: What caused one of the world's largest UFO sightings? Phoenix Lights: What caused one of the world's largest UFO sightings? On March 13, 1997, thousands of people reported a string of bright lights in a triangular formation flying in the sky like a UFO. Dr. Lynne Kitei witnessed the event and said she still doesn’t know what she saw that day. “It was a mile-wide formation of these orbs and I caught them head-on turning into a V,” she told 12 News. The US air force identified the lights as flares dropped by an A-10 Warthog aircraft performing training exercises at the Barry Goldwater Range in southwest Arizona. “How can flares keep a formation, traverse the entire state and beyond for hours in a rock-solid V?” she said. Another person who claims to have seen the lights was Hollywood actor Kurt Russell. The Escape from LA star said he was traveling in a private plane into Phoenix when he spotted the phenomenon, quickly reporting it to the control tower at the airport. Despite the many witnesses claiming the lights were from a UFO, aviation experts said the flare explanation does hold merit. Former F-16 pilot Ty Groh said flares in the sky act like hot-air balloons and go where the breeze takes them, with a strong gust able to propel all of the flares at the same time at a uniform distance. He added that extremely bright objects, like flares, can appear closer than they are in reality when dropped at a distance. “You’ll be looking at airliners that look like they’re 10 miles (16km) away and they’re 400 miles (643) away,” he told 12 News.